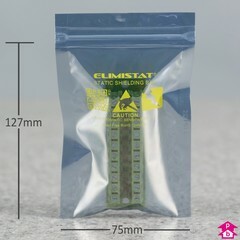 A range of resealable grip-seal Static-Shielding bags to protect sensitive electronic components from electro-static discharge (ESD) outside of an EPA. 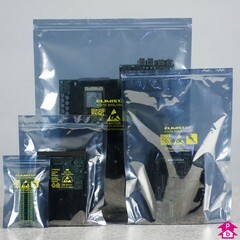 Comprehensively tested to exceed industry standards, ANSI/ESD S541, EIA 625, and to be ANSI/ESD S20.20 programme compliant. 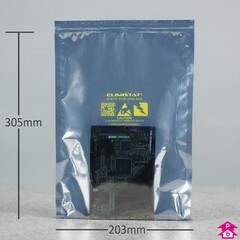 The bags create a Faraday cage around the product and are composed of an internal polyethylene layer, a conductive metallised polyester layer and an external antistatic abrasion-resistant lacquer. 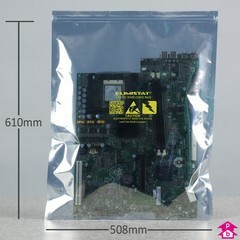 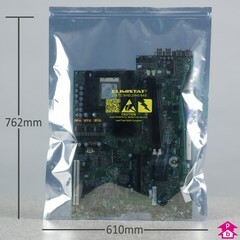 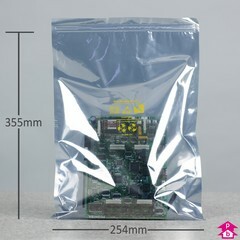 These grip-seal bags have a pre-printed ESD notice and are semi-transparent so their contents can be easily identified. 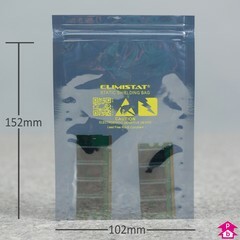 Surface resistance of 10^8-10^11. 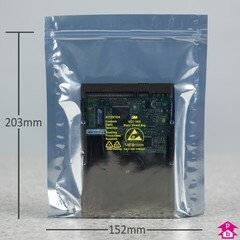 The electricity generated by an electro-static discharge is carried around the metal bag rather than through it, so expensive components such as PCBs can be protected in transit or storage. See also antistatic grip seal bags.